Without witnessing Master's lectures firsthand, any news describing Her amazing ability to attract huge crowds would seem like a gross exaggeration. But after seeing the unprecedented river of people drawn to the Ocean of Love Tour, describing Her as a crowd pleaser seems like an understatement. 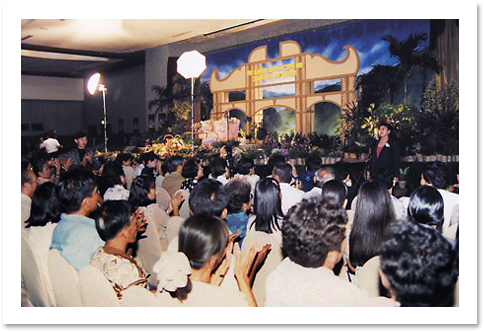 Such an impressively large group from all walks of life streamed into the Manila Midtown Hotel on May 3, 2000, to attend Master's Ocean of Love Tour lecture. The hotel's 3,000-seat Grand Ballroom was packed, with people in every corner. Many could not find a place, even in front of the several television monitors installed in the hotel corridors and lobby. A radio reporter announced that between 6,000 and 7,000 people gathered to hear Supreme Master Ching Hai, and an expert in Manila rallies said that, by his accounting, the number of people at the lecture might have reached 10,000. As early as 10:00 AM, hundreds of enthusiasts had braved the burning mid-summer heat to ensure a free but prized seat for the 7:00 PM lecture. And as late as 9:00 PM, thousands were still gathered outside, waiting for the chance to see and hear Master. "This is phenomenal," said Midtown Hotel's manager. A banquet officer for the hotel also observed, "This is the first time we have experienced a crowd as big as this." "This is unexpected, especially considering that the Philippines is a Catholic-dominated country, and meditation and vegetarianism are not very popular here," stated Dr. Rene Santos. Catholics, Muslims, Christians, Buddhists, and members of other religions were represented at the lecture. Many dignitaries also attended, including Mr. Manuel L. Morato, former Chairman of the Philippines Charity Sweepstakes Office (PCSO); Ms. Eva Estrada Kalaw, former Philippines Senator; Ms. Lourdes A. Genato, Secretary of the Philippines National Red Cross; Mr. Dante Le Jimenez, Chairman of the Crusade Against Crime and Corruption; Mr. and Ms. Joe Lad Santos, publishers of LEADER Magazine, and Mr. Nargarito T. Agnino, Chairman of the Board of LEADER Magazine. 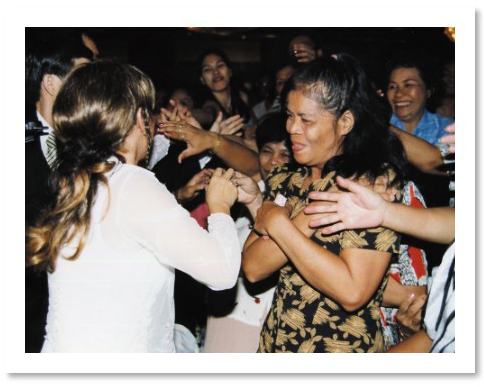 Filipino people open their hearts to the Truth. Master arrived at the lecture hall looking very fresh and beautiful in a simple but elegant white outfit. To greet Her, a group of students performed a Philippine folk dance that depicted the country's culture and the Filipino way of welcoming guests. Before beginning the lecture, Master asked audience members to close their eyes and pray for the Philippines and its people. She then apologized for the insufficient size of the lecture hall. Addressing those who were unable to obtain a seat inside, Master said, "You have a seat in my heart, always." 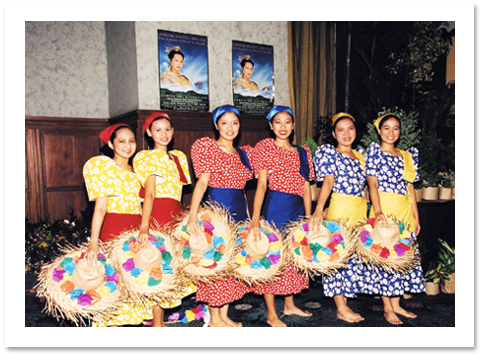 A locak folk dance depicts traditional Filipino welcome. Going on to describe God as an almighty power -- all-loving, all kind and all-forgiving -- Master said that we have to go within to remember and return to the kingdom of God. Speaking with great compassion, She said, "We are from heaven, all of us. Even those who think they are the worst sinners are also from heaven. The reason they sin is just because they are frustrated here. In their deepest subconscious memories, they remember what heaven was like. They remember the freedom, the abundance, the richness and the mighty power they had when they were with the Father." She said that newborn infants also remember their place in heaven, sometimes very acutely! "When we come to this planet and are encased in this physical body, we feel very restricted. That's why babies cry the first moment they come here. If this were such a happy place, they would smile when they were born. It is because when babies are first born, they are still very much in contact with the God power and the Father in heaven. When they contact this very coarse and suffering world, they feel immediate pain and cannot bear it, so they cry." The older we get, the more our memory of heaven fades. There is a reason for this: so that we can continue in this physical life without feeling too homesick. We have to do whatever we have to do here, so God has arranged that we forget our origin, but only for a while. "We have come here so that we can know God. Even if our purpose in life is different, our reason for coming here is different, our way of living is different, the one and only goal we have in coming here is to recognize God. It sounds paradoxical, but it is like that." Master explained that the reason we need this contrast between the physical and heavenly realms is because we have already been in heaven with the Father for all of eternity. We were one with the Creator for all of time. So we need a reflection of all this glory; we need to experience what is not real in order to know what is real. Just like we need a mirror to see our face. The mirror provides only an image or reflection. What we see there is not real, but because of the mirror, we know what we look like on the outside. Similarly, this world is just an illusion, a mirror image, a reflection of the true world of Godhood. But we need it so that we know what God is like. That's why the Bible says to judge not because you will be judged. We should not judge our brothers and sisters because they are God's children also. They are of the same essence as God. We are all children of God, and no matter what a person does, he or she is God inside. We all choose different ways to know God. Some choose a very moral way so that they get to know God more quickly. Some choose a longer and harder way by being less moral, less noble, less good, so that they can learn to know God in a more intense way. Of course, by our human standards, we value good and bad, moral and immoral. Therefore, we have judgment. But in the eyes of our Father, we are all equal, because everything here is an illusion, anyway. Bad or good is not real. It is just a reflection so that we know God in Hiers totality. We have been in heaven for so long where everything so good, so pure, and so perfect that we cannot really know perfection unless we see imperfection -- just as we cannot realize the nature of a man unless we have a woman to compare with. We cannot know goodness unless we contrast it with something bad. That's why we came into this world, so that we can know the worst of the suffering. However, we don't have to continue to suffer or be forever homesick for our heavenly origins. Master told the audience, "I am going to show you the 'within' kingdom. That way, you can see for yourself that we are not human beings; we are not this mortal body. God lives within us. And when God lives within us we are part of God, we are one with God. We are not normal, mortal sentient beings. If we see this for ourselves, then we truly will understand the Bible when Jesus mentions that the kingdom of God is within us. We can see it for ourselves." When describing the kingdom of God within us, Master said, "We will see some of the experiences that the past saints have had while they were in communion with God. For example, St.John heard the trumpet of heaven, and Moses saw God appear in a great column of light. He also heard God speaking to him with a sound like thunder and the sound of many waters. These experiences recorded in the Bible are real, but are not mysterious things that only happened to the saints in the past. They are real and can happen to any of us here today, because we are all children of God. Therefore, any time we want to go within to see the kingdom, we can do it. It's just that we don't. We normally see candy, flowers, people, work, money, cars, traffic, and the sun and moon outside. But we don't ever try to go inside, which is a completely different world and is the true world. The kingdom of God within is full of glory and full of Light that is brighter than 10,000 suns of this planet. But it doesn't burn your eyes; it doesn't make you feel uncomfortable. It makes you feel more elated, lighter, wiser, more loving, kinder, and nearer to our original abode, which we call 'heaven'." Master continued, "The reason we are unhappy is that no matter how much money we have and how high a position we have in society, we have forgotten this true kingdom of God. Jesus said not to lay up our treasure in this world, that our true treasure is in heaven. What He meant is that we must see this treasure from the inside, and then our life becomes better all the time. Even in our outer life, the inside treasure will manifest and make us a different person. Our look will be different, our thinking will be difference, our work efficiency will be different, and our intelligence will be different. Our whole outlook will become different from the inside out." "I look different today than 15 years ago. Everything I have today is because of what the kingdom of God has given me. As a human being, I could never accomplish anything. I was nobody until God graced my soul with Hiers own love and knowledge, until God was awakened within myself and showed me that Hes was there. Hes showed me that I could always love Hirm, rely on Hirm, and call on Hirm. Hes told me that Hes is the Supreme Master. 'Ching Hai' means Ocean of Love. It's not my physical name. It is the name of our Father. We can also call Hirm many different names; it doesn't matter. Just like we call our mother, 'mom', 'mommy', or anything, but she knows and we know." "If we don't recognize our True Self, we can never truly be happy. But if we know God, we are already happy when we are in the physical body, so that when we die, we continue that happiness and only angels and saints will come to greet us. Being originally from heaven, we just 'borrow' our body for the time we are here. This is similar to living in a hotel or driving a car. Both are convenient for different purposes. But our Real Self is the driver; it's not the car. As the driver, we can step into or out of the car at any time, and enjoy different things. Similarly, since our True Self is within us, we can go within to the kingdom of God and then come back out. That is true liberation, true freedom while living." "Having found the kingdom of God inside, we can take care of our family and other responsibilities while still enjoying heaven whenever we have free time. And when we become very adept at going within and coming back out, we even can do both at the same time. We can clean our teeth and talk to God. We can wash our dishes while seeing heaven, but this requires practice. We need practice because we have forgotten not only that the kingdom is within, but also that we can be free of the body at any time." To illustrate the powerful hold of this habitual thinking, Master told the story of an airplane pilot who often had overnight duty. At work, the pilot became accustomed to sleeping in a chair that reclined rather than sleeping in a normal bed. He used this recliner chair often at work, which added up to a lot of time in his life. After a while, he found he couldn't sleep in his bed at home. He had gotten so used to sleeping in a chair that his ordinary flat and comfortable bed became uncomfortable to him. The pilot finally bought a chair exactly like the chair at work so that he could sleep at home. Master asked, "Can you imagine? Habits can be so binding, so powerful, that they can make us forget everything else. Similarly, we have sat inside this body for so long that we have forgotten to leave it until the time of death comes, and even then we are reluctant to leave it. We cry and struggle. We don't want to leave the body that causes us so much pain and suffering and work. For this body alone we work ten hours a day. We have to do so many things to keep this body alive, and yet when we die we don't even want to leave it. But heaven is supremely beautiful! Once we know that, we want to leave the body and this world immediately. We don't want to stay here one more second. That's why the saints of the past and present have never cared about dying or not dying. They have never cared much about material comfort because they know a better life inside." Master said that learning to return to our heavenly Home is actually easier than many of the things we have to learn in the physical world. "To learn to drive is difficult. Even learning to eat as a child is difficult. But to learn to go back to heaven is not because that is where we are from. We already know everything about heaven from the time before we came here. Otherwise, where do you think we came from? If we didn't come from heaven, where do you think we came from? Who is the 'we' that comes into this physical body, and who is the 'we' that leaves this physical body? It is the Real Self, the oneness with God, the essence of our Being." "This essence of our being can always leave this body and come back again, anytime. This is the art, the real art of living, the true thing that we have forgotten. And that's why we suffer. We have so much pain, frustration, and sorrow. Sometimes we do things against our good judgment because we forget our great Self. We are just thinking about food, about our job, about problems. We forget that we are so great that all of these problems, all of this poverty and all of this struggling, are nothing at all to us. Once we regain our glory and power again, nothing matters to us anymore on this physical planet. Even though we still continue to work, it's just child's play to us because we know we are great." Master's closing words for the lecture would inspire hope and inspiration in anyone seeking true liberation: "After you become one with God again, you remember your Self again, you will love without loving, give without knowing. You will become compassionate without thinking that you are even compassionate because we remember God, and God will do everything. The ego will go; the mind will die, and God will take charge of everything in our daily life. Every activity, every thought and every word that we speak will be from Heaven. That's how we become one with Heaven again." During the question and answer session that followed the lecture, one person asked why God doesn't manifest Hiers power by performing as many miracles today as Hes did in the time of the saints. 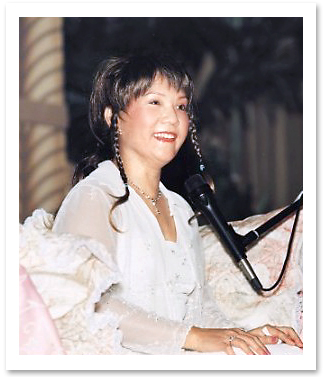 Master answered by saying that God is still performing miracles every day. However, since we are accustomed to seeing the world with only our physical eyes, we fail to behold these miracles with our heavenly eye. We can only see what God is doing if we go within and contact Hirm. Elaborating on the vegetarian diet, Master said that it is a compassionate way of life, and that we do it because we respect and love all beings equally. By eating meat, we harm animals and cause them suffering because of their fear of death, whereas eating plants does not have the same effect because they can grow again. In response to a question about whether She believes in the second coming of Christ, Master said, "Yes, I do. He comes every day!" She went on to say that Christ is not dead; he just lives in a different dimension now. If we want to see Jesus or any of the great past Masters, we have to leave this physical body and ascend to the higher places where all the Masters stay, and then we can learn from them. Master said that She is here to show us how to go to this "greater school" and learn with the great Teachers. Humbly, Master said that God gave Her this job because all the other jobs had been taken. "Hes said, 'There is a vacancy. Every other job is already occupied. This job is vacant.'" She went on to assure us that we could all do this job. "We are all the same. It's just that you have forgotten how to step in and step out of the kingdom within yourself." She promised to tell people all that She knows, unreservedly. "What I know, you will know." She invited everyone to practice this Method, and to do the job of being Enlightened Masters together. When asked, "What is the greatest happiness in this world? "Master replied, "To know God." In answering many questions, Master pointed out that we suffer because we don't know God. When one questioner asked, "Where does God's kingdom come from?" Master said She would guide people to see God, after which they can ask God directly. A person from the audience asked Master why She was wearing fancy clothes and jewelry, and Master said that She liked it. She added, "Just like you put flowers here (on the stage) for me, I try to make myself beautiful for you." Master also mentioned that with the money She earns from fashion and jewelry designing, She could buy air tickets for activities such as the lecture tour. In this way, not only has She no need to accept offerings from others, but She is even able to contribute to the needy in many countries, including the Philippines. She then consulted the audience for their opinion: "Can I continue with my designing and dressing?" The audience replied loudly, "Yes!" Master's biographical sketch and Ocean of Love Lecture Tour are prominently reported in local media. After the question and answer session, everyone rose and sang "Happy Birthday," to celebrate Master's birthday in advance. 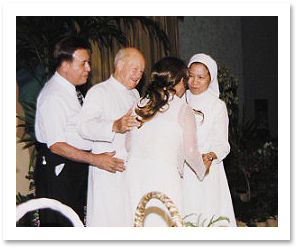 Some guests, including a clergyman and two nuns, went up onto the stage to embrace Master and bid Her farewell. After the lecture, several hundred people received initiation or learned the Convenient Method. Days after the lecture, with Supreme Master Ching Hai already gone, requests for information and initiation were still flooding into the lecture office in Manila.